The Masters Association of Sri Jayewardenepura University recently held its first open forum titled ‘ETCA Hiccough’ to discuss Sri Lanka’s proposed trade agreement with India. It was the first open forum where over 75 associations, organisations, professionals and trade unions took part to raise their concerns over the signing of the Economic and Technology Cooperative Agreement (ETCA). The prime motive of the ‘ETCA Hiccough’ forum was to strengthen the link between the general public and economic and social policy. The forum was conducted in two sessions featuring four speakers, including former Central Bank Deputy Governor W.A. Wijewardena, Government Medical Officers Association (GMOA) President Dr. Anurudda Padeniya, United Professionals Movement (UPM) Media Spokesman Eng. 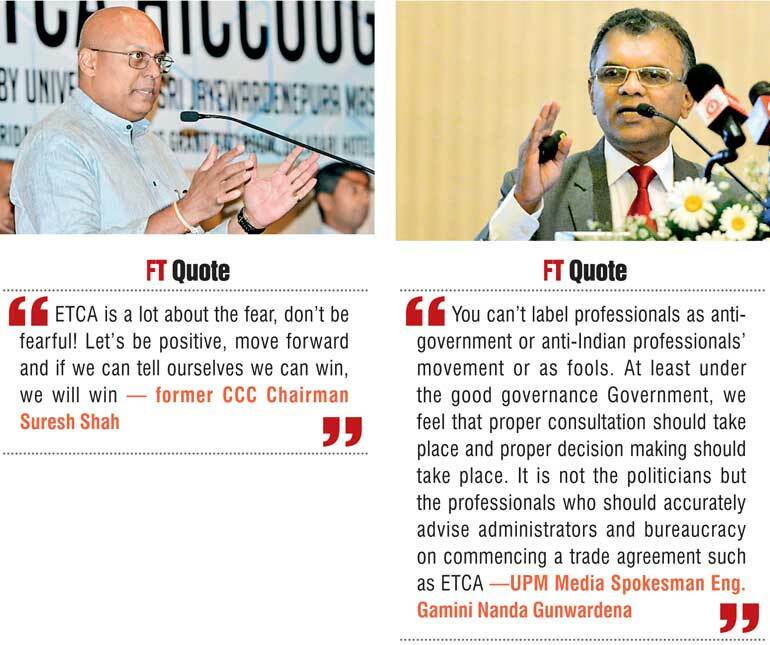 Gamini Nanda Gunawardena and former Ceylon Chamber of Commerce (CCC) Chairman Suresh Shah, who made their observations on ETCA, followed by a panel discussion moderated by Daily FT Editor Nisthar Cassim. Delivering the opening remarks at this important dialogue, University of Sri Jayewardenepura Vice Chancellor Prof. Sampath Amaratunga said the institute had been in the forefront of contemporary and continuous socio-political and economical events, providing intellectual contribution and guiding where necessary. Hence, he said that ‘ETCA Hiccough’ was a similar event which warranted attention and appreciation by everybody showing interest and concern about this crucial issue. He pointed out that the proposed agreement between India and Sri Lanka focusing on trade, investment and technology had generated diverse opinions with concerns and disagreements as well as attributions. “Many stakeholders of the Sri Lankan economy have raised concerns over this matter. This claims that entering into an economic partnership with a larger and a much more diverse economy will negatively affect Sri Lanka, rather than attracting benefits,” he said. “A progressive Sri Lankan Government that is forming an exclusive economic partnership agreement with India will be unconventional as the two economies are not comparable and compatible with each other. However, there are positive views also at the same time. Different parties that welcome the proposed agreement cite the amount of overall bilateral trade and investment between the two countries to support the agreement. Thus, in their view, for small countries like Sri Lanka it is always advantageous to engage with a larger trading partner like India and ETCA will provide that framework for deeper economic engagement with India,” he noted. However, the Vice Chancellor mentioned that University of Sri Jayewardenepura was not advancing any opinion on this matter in the present forum; instead it was providing diverse stakeholders a platform to engage in mutual, critical discussion. “The University of Sri Jayewardenepura is just a facilitator, and key observant. I’ve no doubt that this forum will stimulate some inspiring, intellectual perspectives which will enlighten society on this matter. Let us look forward to such inspiring talks and exciting moments,” Prof. Amaratunga asserted, kicking off the forum. Making the first observation, former Central Bank Deputy Governor W.A. Wijewardena said ETCA was simply the evolution of Indo-Lanka Free Trade Agreement (FTA), which the country enjoyed since 1998; however, thanks to Dr. Padeniya and various other stakeholders, ETCA had now become a common word in Sri Lanka. Noting there was no initial ‘hiccough’ when the Indo-Lanka FTA was signed in 1998, he said the current context was different because we are in an era where everyone expects the value of the public opinion given the current ‘good governance’ regime not only in Sri Lanka but throughout the world. “Good governance has become one of the key words in public economic policy. In terms of public economic policy, it has become necessary to consult the public and no public policy can be implemented by any government in isolation. However, we have to modify the economic policy to meet the aspirations of the people. After all, any public policy implemented by the Government is for the benefit of the people of the country, not for the people who are in power,” he added. Stating that trade between the two countries had expanded tremendously since 2000, he said India was generous to provide 80% of Sri Lanka’s exports under the Indo-Lanka FTA as opposed to 10% of total imports from India, which had eventually made India became the number one source for imports and number three destination for Sri Lanka’s exports. “However, according to what Dr. Padeniya and Gunawardena have been portraying at public forums, the trade gap between India and Sri Lanka has been expanding at a substantial pace for the benefit of India, not Sri Lanka, and therefore this trade agreement has been a failure. But looking at the data and the goods covered under the FTA, it is evident that there are some years where we have had trade surpluses and some year’s deficits but as a result, overall it has been to the benefit of Sri Lanka. “Now this is what I feel disturbed the professionals, because they think the trade gap between India and Sri Lanka has expanded so much and as a result the professionals legitimately feel that the Indo-Lanka Trade Agreement was for the benefit of India and not for Sri Lanka. One of the important things we have to understand here is, when we go into a trade agreement with other countries, the objective is not to have a trade surplus with that country, but to promote trade. Trade is we have to buy goods from that country and we have to sell goods to that country as well,” Wijewardena explained. Citing an example, he pointed out that there was a huge trade surplus with the US and European Union (EU), but of course there are trade deficits with India, China and Japan owing to the fact that Sri Lanka is importing goods from those countries which you cannot import from the rest of the world, causing a trade deficit with those countries. At the same time, Sri Lanka is producing goods which are demanded by countries like the US, EU and the UK thereby enjoys a trade surplus. Thus, the objective of any trade agreement is not to have a trade surplus, but to promote trade which the Indo-Lanka Trade Agreement has done, he added. He said professionals were feeling threatened because India was a big country and advanced in many professional services as they are selling those services not only to Sri Lanka but for EU nations and the Western world and they believe it will thereby try to dominate the Sri Lankan economy. Noting that Sri Lanka is in a ‘serious economic crisis’, he elaborated that it was not because of trade with India, but due to the overall deficit in the country’s total balance of payment (BoP). “Sri Lanka’s Rupee is under pressure because the Government is selling our foreign reserves and as a result we feel that Sri Lanka will lose everything. 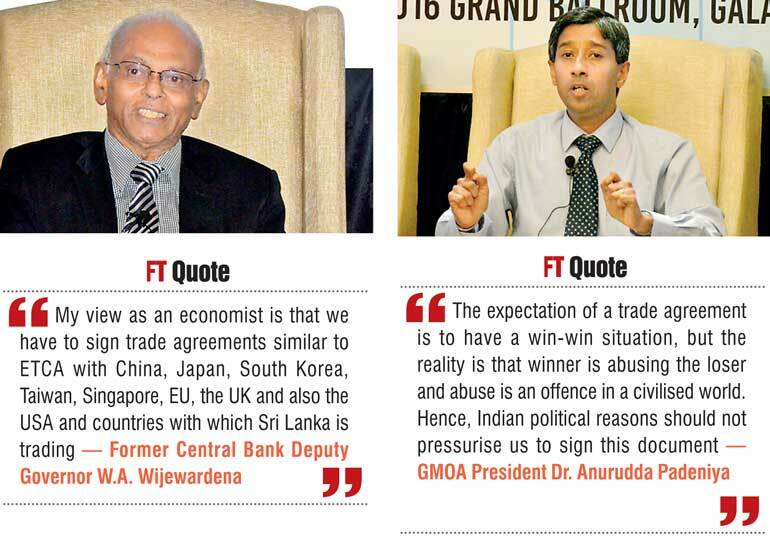 My view as an economist is that we have to sign trade agreements similar to ETCA with China, Japan, South Korea, Taiwan, Singapore, EU, the UK and also the USA, in countries with which Sri Lanka is trading,” Wijewardena pointed out. GMOA President Dr. Anurudda Padeniya making a presentation stated that people in this country had taken patriotism as a crime and it was unfortunate that the interpretations of patriotism were looked at differently. It was noted that a methodological approach was needed in the best interest of the country and that the proposal would be developed based on common sense where the intention would be to stand together. “We are products of free education and we want to bring everything back to the country for the best interest of the people,” he said. “The country needs a senate or platform to provide professional, scientific and technical input to the economic system; such an initiative needs to be backed with clear responsibility and accountability with a declared process for the activities involved. It is critical that answers must be gathered for questions such as: Where is the forum for us to talk and give our inputs? What is the process of developing a trade agreement? Who is responsible in developing this trade agreement? Who is going to take accountability for the process and execution? Today there is vacuum and discussions which are taking place makes media the judge and it is not healthy considering the purpose of such discussions,” he noted. Showcasing sensitive pictures of an open heart surgery, he pointed out that Indian doctors were performing operations on Sri Lankan grounds in private sector hospitals without due qualifications as there was no room for them in the public sector hospitals thanks to the strict procedure and regulations. “Process and authority guidelines are in existence concerning the National Wage Policy, Grade One school admissions, and Railway schedules, however it is ironic that an important national matter which impacts the whole economy such as trade agreements is left out without a proper policy or direction. I think it is not fair by the countrymen,” he stressed. Justifying why the GMOA did not oppose Apollo Hospital, he said it was because the establishment was a unilateral agreement. “It was under Sri Lankan jurisdiction. However, whereas if you sign the bilateral agreement, the matter is going to the Judiciary and ultimately it will put in the arbitration. A physical person will be involved based on discussed trade agreement details, and this will not only involve people, but will involve the cultures too, hence will be a ‘bond going beyond people’, where we must keep an eye,” he pointed out. Commenting on the impact on the trade balance, Dr. Padeniya said that they find it severely unhealthy as Sri Lanka was losing compared to India, but considering the rest of the world the country’s exports are in the positive direction. “Simply, we are at loss, relatively at more loss, and escalating our loss with India. We are not anti-Indian, but India is not honest in this business. Trust is the most important factor in trade agreements,” he stressed. Further, he asserted that according to their observations and learnings, no economic advantages or lateral advantages were found in trade between Sri Lanka and India over the past 15 years. “Sri Lanka’s exports to India have declined to 7% with no development seen in the industrial sector. However, the country’s exports to other trading partners such as the EU and US has increased by 31% and 24% respectively,” he added. According to Dr. Padeniya’s proposed way forward, principle elements needed in the process of framework development include transparency, accountability, appropriate and adequate consultation and consensus, experts and stakeholders. As an added component, views of foreign experts could be included to complete the mechanism. He repeatedly emphasised on the importance of careful analysis before signing any agreement and the need to be responsible and accountable, pointing out that going for business is ‘optional’. “A rational approach to trade agreements is not ad-hoc actions, but a proper process and an authority for international trade as it is the need of the hour,” he emphasised. He added that the GMOA had no compulsion as experts had been advocating and despite the regime changes, the advocacy board on the trade agreement had been the same. It was mentioned that every profession needed to do their part correctly and when in a crisis everyone needed to take accountability and not take anything for granted. “In trade agreements, it is important to qualify and quantify the expected outcomes. Doctors in this country have worked hard to generate revenue with valuable human resource. With this initiation we have gone beyond health to help the economy of this country,” commented Dr. Padeniya. He highlighted that concrete proposals were critical to match the expected outcomes of trade agreements and that was exactly what the GMOA had been requesting, adding that such proposals should be sensible as well. Noting that the norm of transferring decision making power to the Parliament for most trade agreements was not the most suitable, he explained that no expertise, no experience, their obligations to political party/parties as well as personal obligations were factors which did not reflect accountability in their decision making. Hence, he suggested that powers should be delegated to the experts in the field via a process framework where continuous improvement could be made. Dr. Padeniya stressed that the GMOA was in the process of writing to the United Nations (UN) Secretary-General Ban Ki Moon about the exploitation of developing countries by developed counties. “The expectation of a trade agreement is to have a win-win situation, but the reality is that the winner is abusing the loser and abuse is an offence in a civilised world. Hence, Indian political reasons should not pressurise us to sign this document,” he stressed. Response from Wijewardena – Big man dominates! Responding to the presentation made by Dr. Padeniya, the former Central Bank Deputy Governor claimed that he showed the audience how ‘big man’ could dominate by giving a live example of using one hour for his presentation, whereas the entire time given for the forum was three-and-a-half hours, while Gunawardena also spent more than 35 minutes to explain. He said India as a big country had been very generous to Sri Lanka by giving a large number of items under the FTA. With respect to the list of imports from India, 90% of our imports come outside the Free Trade Agreement, while 90% of the exports going to India from Sri Lanka are under the FTA. Despite the non-tariff barriers imposed by India, many countries such as China, Singapore, and Thailand are performing sizeable trade with India. Hence, non-trade barriers should not be a barrier at all; rather they should be an incentive for people to do trade with other countries. “Gunawardena mentioned he doesn’t like politicians, I also don’t like politicians. But what reminds me is that at the Simon Fraser University at which I studied in Canada, the entrance to the Political Science Department has a slogan which says ‘If you want to see the contemporary politicians, stand in front of a mirror’. This means that politicians are not different from us, they are also like us. We can’t say we can take the case against them, because it is we who have elected them to those positions. If we think that those people are inferior people, it is because we are being ruled by inferior people and because of our refusal to take part in it. Therefore, as a group we have to be united and must make our case before the politicians, as they are not superior power people of this country,” Wijewardena noted. Citing practical examples, he explained that there were patients who had died under the care of doctors, economies that have collapsed under the care of economists, big buildings that have cracked under the supervision of the best engineers and newspapers that have gone bankrupt under the supervision of the best editors. Hence, he urged professionals that it was important to remember to admit failure as well. Stating most of the criticism made by Dr. Padeniya with horrible pictures was to show the failure of Indian doctors, he added it also demonstrated the failure of the profession. “One of the important facts about the professionals is that profession is always a fail. Dr. Padeniya was just looking at one of the worst cases of India. Imagine Indians looking at Dr. Padeniya’s case? We have doctors who have operated the left leg when the wound was on the right leg. Economists are at least modest and humble enough to say that they have failed. Similarly, all other professions have progressed not because they are the best people in the world, but because they have admitted failure. If we document all these incidents, no one can give credit to any of the professions including the economy,” he added. Acknowledging Dr. Padeniya and Gunawardena had presented the same again and again, he commended Shah for very clearly presenting the case for international trade. “The fear that was created by Dr. Padeniya and Gunawardena against the professionals in the country was very accurately cleared by Shah. If you’re good enough, you don’t have to be feared to be competent. The fear is created because we think we are inferior. 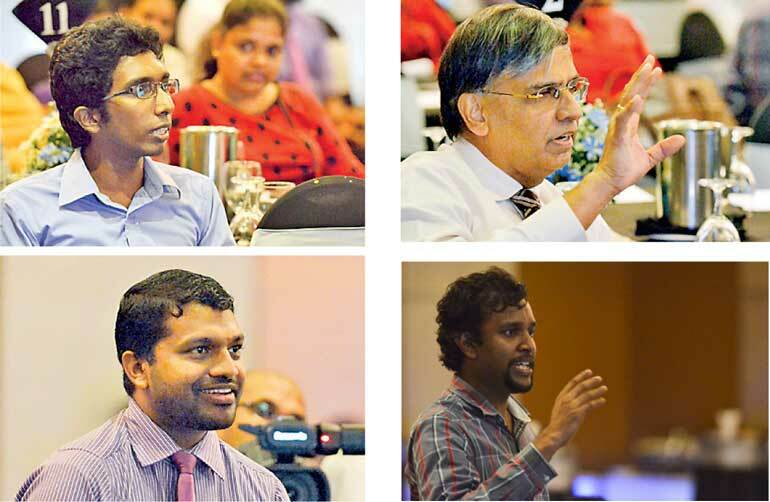 This inferior complex is the worst enemy we can have,” Wijewardena stressed. Looking at the Sri Lankan environment, he explained that trade agreements were not about businesses, professionals or companies, but about creating jobs opportunities for people who were underemployed as well as unemployed. While looking at the official statistics which state the unemployed number of people is 400,000, he said the reality was far different to that. According to statistics in Sri Lanka 30% of its population is employed in agriculture, and their contribution to Gross Domestic Product (GDP) is only 8% or 9%. Noting that Sri Lanka’s market is extremely small with a population of about 20 million people and an economy which is only $75 billion, he emphasised the logic with trade agreements is that it adds on markets to the current market. “Markets, investments and jobs are the reason of trade agreements. When there are markets that absorb products and services, people invest; when people invest, they need to hire people to work in those organisations. This is how trade agreements benefit countries,” he explained. Highlighting the types of trade agreements such as multilateral, regional and bilateral trade agreements, he said the best was to enter into multilateral, while the easiest to enter was bilateral as it was less complicated. “The complexity about multilateral and regional trade agreements is that there are number of countries involved in the process and it becomes very complex, whereas in bilateral it is just two parties and it’s easy to form an agreement. However, the ideal models are multilateral and regional for the key reason that it adds on to your market, but because of the complexity the pragmatic approach would be to take the bilateral route,” he added. ETCA: Does India fit this bill? Shah stated that fundamentally from a Sri Lankan perspective, trade agreements, whether bilateral or multilateral, were beneficial to the economy. In terms of considering a trade agreement a country is essentially looking at the size of the market, product basket with complementary products rather than competitive products, access to other markets, investment opportunities, and the proximity. “According to statistical analysis, India will very soon have the world’s largest population with a high-spending young generation, close proximity, good market access and by 2030 it would be the third world’s largest economy with $30 trillion. Considering the main criteria from an overall perspective, India fits in well for Sri Lanka,” he stressed. Furthermore he pointed out that around 40% foreign attendees at the recently-concluded Ceylon Chamber of Commerce (CCC) investor forum wanted to invest in Sri Lanka because of its geographical location sea lane and proximity to India. Do we need to be afraid? He said that India imports $ 450 billion worth goods every year as opposed to Sri Lanka’s $ 10 billion exports, which in reality means that India can absorb everything Sri Lanka could export and it would still increase its import bill only by 2.5%. This is the advantage Sri Lanka has and the point we have to emphasise to the Indians. India exports $300 billion annually and Sri Lanka imports $20 billion per year. Therefore, even if every import of Sri Lanka is going to come from India, it would still not give them a 10% boost in their export trade, he added. “Is this $10 billion a big deal for them to go after Sri Lanka? India has Comprehensive Economic Trade Agreements and Comprehensive Economic Partnership Agreements (CEPA) with Singapore, South Korea, Malaysia and Japan and they are just about to finalise one with the European Union. In addition, they are looking at New Zealand and Australia. They also have Free Trade Agreements (FTAs) with the ASEAN region — much larger economies than Sri Lanka. I think the Indian focus is not on Sri Lanka as they are already playing in much bigger markets,” he explained. Pointing out that trading goods and services go hand in hand, he noted that services could not be segregated from trade. In order to be fully benefited by trade agreements, it is important to include both goods as well as services. According to Shah, around 70% of transhipment that goes out of Colombo Port is to India, while 40% of SriLankan Airlines’ revenue is also generated through the Indian routes — which are mainly services. In the event Sri Lanka takes India out from its business, Colombo Port wouldn’t be able to perform, reflecting different trade balance equation numbers. “Everyone is afraid that the Indians will rush to Sri Lanka and take away all the jobs. Are we going to say that we are a bunch of unskilled, incompetent people who don’t have the capacity to compete? Is this true of Sri Lankans?” he asked. Mode 4 is not in! Shah assured that Indians cannot come to Sri Lanka and take away jobs for the simple reason that Mode 4, which allows the natural people to come in, was not on the ETCA agenda. Noting that India was a difficult country with which to do business, he highlighted that China with $60 billion, Thailand with $6 billion and Indonesia with $15 billion exports had got through to this huge market despite the non-tariff barriers because it was important for them to expand their market size. He said during the past 15 years the country’s exports to India had grown more than tenfold from $55 million in 2000 to $598 million in 2015, while imports from India also expanded 6.5 times from $600 million in 2000 to $3.9billion in 2015. In terms of the trade that had taken place under the Indo-Sri Lanka FTA, country’s exports have grown from $8.6 million in 2000 to $406 million in 2015 — just under 50 times – while imports from India under the FTA had grown from $54 million in 2000 to $240 million in 2015, which is under five times. Looking at the process followed by previous Governments with regard to entering into trade agreements, he said that there was a significant improvement, but claimed that it was not the ideal way either. “The fact is that the Government is committed in sharing the information and getting feedback before they move forward is a significant improvement. They are still on the framework agreement. I’m quite confident from the conversations that I’ve had that the Government will get feedback before it moves forward. So it is a much more transparent process than what was followed previously,” he quipped. Clarifying a common speculation on ETCA, he asserted there was no agreement being signed and there was no draft agreement on ETCA, but what there was a draft of a ‘framework’ agreement. “There is no ETCA draft! Framework is what you agree within which you negotiate. The draft framework agreement I know was circulated among all trade chambers as well as professional bodies in Sri Lanka. Now I also understand that the Indians have also given a draft of their framework agreement to Sri Lanka. There may be some people who had seen it, but I’m not quite sure,” he said. According to Shah the draft framework agreement has an asymmetric approach which has put forward dispute resolution mechanism, early harvest mechanism and mutual recognition. However he noted that doesn’t mean the agreement is ideal and fantastic. He said if Sri Lanka could sign trade agreements with huge trading partners like China and India, every country would want to come and invest here to access these two markets. Although there’s a lot of trade happening between China and India, the two countries don’t have the best political relationship, hence it is advantageous to Sri Lanka as they would prefer setting up businesses here which connect both markets. In addition, it will create a huge potential for jobs, which would eventually shoot up the salary scales considerably. “ETCA is a lot about the fear, don’t be fearful! Let’s be positive, move forward and if we can tell ourselves we can win, we will win,” Shah pointed out. UPM Media Spokesman Eng. Gamini Nanda Gunwardena stated that politicians in this country had taken every citizen on a ride with agreements and they attempt to personify as if we are in a fairy-tale where things will be changed and executed. However, as responsible professionals the UPM considers it important to converse facts and figures to see the clear picture, thus it become an essential and relevant topic for discussion, and appreciated the efforts of the association for proceeding on the right path. He said the Sri Lanka Engineers Association that spearheaded UPM repeatedly emphasised that the formation of its movement was for professionals to get involved in policymaking and it was not ETCA that mattered to them. Gunawardena said despite the sizeable market of $1.25 billion, one third of India’s population still had a daily income of less than $1.25. Hence, he cautioned not to be misled by the numbers and requested a careful analysis of the details before drawing plans. He also emphasised on the importance of propagating a long-term vision and a long-term framework for national development, adding that human development had become more important than ever before as the world was moving towards a knowledge-based economy. Thereby he suggested prominence should be provided to any component for skill development. “We would want to see that the important elements are addressed through these agreements as it will have a major impact on the overall decision-making process,” he pointed out. He asserted that it was in this backdrop that UPM informed Prime Minister Ranil Wickremesinghe that its initiation was to be part of the economy, as UPM understood what was happening in the economy. “It is this dialogue that will help the Government mitigate the negative impacts of FTA; it will also prepare the guideline for strengthening the national legal framework and it would facilitate in establishing a Human Resource Development Council for the betterment of the country and we are simply requesting the same for the Government. Establishing a transparent stakeholder consultation process is being done and at the moment we are conducting discussions with Minister Malik Samarawickrama in this regard as well as on the need to carry out a sector specific skill gap study which is still unfulfilled and needs attention to be evaluated,” said Gunawardena. He emphasised that before entering any agreement, it was vital to define our strategy to gain competitive advantage, where we equip ourselves with the right weaponry to ensure establishment of legal and regulatory enactments to protect both the local and foreign community who are part of this agreement. Elements which are not defined by a policy should be covered with the agreement to ensure Sri Lanka is not going to battle, he added. “Our request for the Government is not to sign framework agreement or any comprehensive agreement until we all work together for six months to put our house in order, because we need a better future for our children,” he stressed. Q: My question is to Wijewardena. You once analysed the GMOA website and Dr. Padeniya’s speech made at Viharamahadevi Park. I have three specific questions for you. Do you agree with those five steps that Dr. Padeniya proposed? Do you think what he suggested is rational? Do you think there should be a national policy before signing ECTA framework? Wijewardena: Number one is I do not agree with him. I think his comments were more emotional. We are discussing trade and ECTA. One is that they should have enough time, they should have enough information and if all these factors taken together then only we can say if it is rational or not. To speak of the national policy, first we must define what the nation is. I don’t understand when he says nation call Sri Lanka, nation called India, nation called Dr. Padeniya. Dr. Padeniya: That’s not emotional. Those are facts and figures and more importantly about lives of people. Q: If it is a draft paper agreement that’s going to happen, do we have enough time to analyse this before we sign up? Shah: Initially we must understand that it is a framework agreement. It’s is not the ECTA agreement. It just sets the framework within which the final agreement negotiations will take place. Once the framework is signed the negotiations on ECTA will commence within the framework agreed upon, which is in the framework agreement. Dr. Padeniya: It’s exactly what the politicians say. Compare and contrast a framework agreement and a draft agreement. Shah: This is very simple. When you all have a stomach ache, whom do you go to? Not to me because I’m a Chartered Accountant, but to Dr. Padeniya. When you want your accounts sorted you come to me. So likewise, when it comes to economy, let’s all listen to the economists rather than the chartered accountants or the doctors, or the engineers. Q: If you sign a framework, all the draft has to be on the framework. So why are we rushing to the framework? Shah: Framework is in the negotiation level, we can always withdraw. We are not rushing. The CEPA negotiations started in 2003, this is 2016. If 13 years is rushing, I don’t know what you’re talking about. Q: On the potential for a larger market, do we know what we can export? Can we see ideal ventures? Shah: You can set targets, but in terms of what we can export, it is up to the entrepreneurs. As the Government and policymakers, they must create markets; thereafter it is up to the entrepreneurs and businesses to go out there and get that market. This is looking at the situation from a Sri Lankan point of view. Let’s say that there is no Sri Lankan business that can export into India, but like I said earlier it is about jobs for Sri Lankans. What matters is if a German company comes and sets up in Sri Lanka to export to India, if we can get employment out of that. Dr. Padeniya: It is a very good idea, but if the German company is going to invest in Sri Lanka this country, they should do a proper stage of study. Unless there’s nothing done, you assume that everything is fine. Q: Skills was mentioned as one of the hindrances. There is a huge need for the tourism sector. We need 130,000 people in four years’ time and we cannot produce that. What’s your response? Gunawardane: Shangri-La is coming up, new hotels are coming up, and then you need a round 40,000 jobs. As country, can’t we have a policy and work towards a strategy to meet such challenges? I’ll give you an example. There are complaints saying that there is shortage of garment workers, but if we go to the north and east there are enough of people who are available. They don’t want to come to Colombo because they don’t have a place to stay. The industries are saying ‘give us an opportunity, from the Export Development Board (EDB) funding at 5% rate to pay back, we will put up hostels for these people to come and stay here, so that the construction will also boom and we will upgrade the skills of the people’. It is the responsibility of the Government and professionals as well as all stakeholders to work together rather than importing from somewhere and trying to solve problems. Dr. Padeniya: Now this is what I said; quality and quantity both are important. If you look at the health sector in the country, it has shown results as one of the best in the world, providing high quality at a minimal cost. One classic example is cataract surgery. Our waiting list is only two weeks and we have only about 30 eye surgeons for the whole island. But in Australia you have around 2,000 surgeons but they have a two-year waiting period for it. Sometimes we do around 20 eye surgeries within an hour with international standards. That is the value. If you want to sustain you must do it at a high quality at a low cost. Similarly, the trainability of Sri Lankan youth is very high; therefore we can train them to do multiple tasks. You must look from a very constructive angle, but when you are biased to India you cannot see any other opportunities. Our foreign trade, every consultant in Sri Lanka there is a legal and academic obligation to get training from the Centre of Excellence in the UK; as a trade union we have never asked to stop that. Two years in Sri Lanka, two years abroad. But none of our consultants are going to India. Why? Because our doctors are not allowed to work there as and when they want to, there is a stringent process. That’s what I said India is commercial-oriented health and at the same time patients are dying without basic training facilities. Shah: I need to respond to a couple of things that Dr. Padeniya said. He said that the health and education sector are doing fairly well and other sectors are not. As a Chartered Accounted I take offence at this because Sri Lankan Chartered Accountants are also of very high quality, CIMA accountants are also of very high quality, IT graduates we produce are also of high quality, the engineers are of high quality. So I don’t think that it is the doctors and the education sector. Dr. Padeniya also said that young Sri Lankan are very trainable and they have high skill levels. That’s excellent because if we have the skills we don’t need to be afraid to compete with anyone – that’s the bottom line. One other thing that Gunawardena said about the entrepreneur who is waiting for the ADB to give a facility so he can go set up a business, this is the exact problem that Sri Lanka has. We are all waiting for somebody to tell and give something to do something. If a Sri Lankan entrepreneur wants to set up a business in the north or east, let him do that because there is an opportunity to make a return on that investment. Dr. Padeniya: What I said was health has done better. Health is not delivered by doctors themselves. The health sector is high in its parameters and that doesn’t mean that doctors are good and the IT are bad. But from a bigger picture where the entire sector is concerned, it is in a better position. Q: Sri Lanka doesn’t have a national policy other than free education, but we have progressed. As a progressive nation, what would be the best way to address these issues? Have you all conveyed of the importance of a national policy to the Government? Shouldn’t we use this as an opportunity to solve this problem? Dr. Padeniya: We have given our views in writing. Irrespective of the changes of the Government, it has to be policy driven and not ad-hoc. Again everything is run in the framework of hiccough. There had been a salary hiccough from 2000, but thanks to Charitha Ratwatte and K.N. Choksy we introduced a National Wage Policy, as a result there aren’t strikes now on salary. There are no hiccoughs, but formal discussions because we have a forum to discuss them. Similarly, in terms of international trade, let’s have a formal platform not to have hiccoughs. We have to these this hiccoughs through a policy driven approach as opposed to an ad-hoc approach.